How do I set up Cloud Sync in Banktivity? 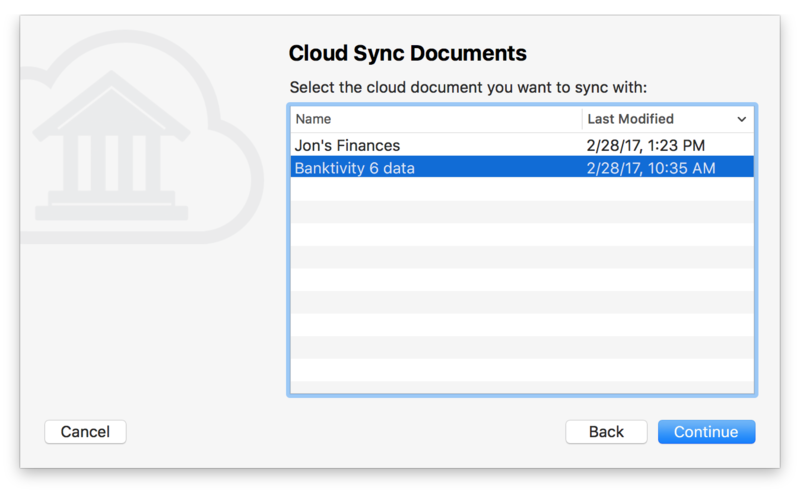 Please note: if you have been using Cloud Sync with Banktivity 5, you will want to either remove the Banktivity 5 application from your Mac or disable Cloud Sync, as syncing between Banktivity 5 and Banktivity 6 or 7 is not supported. Syncing across different major versions of Banktivity may corrupt your financial data. 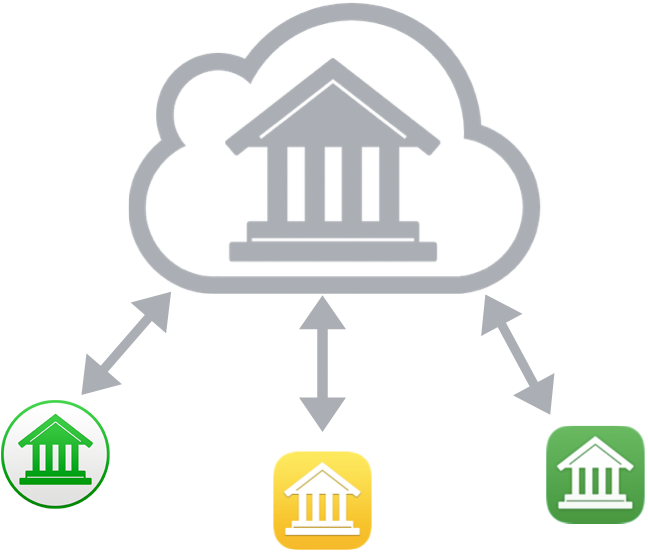 To use Cloud Sync, a free Banktivity ID is required. Once you sign in with your ID, you may upload one or more documents to the cloud server where they can be accessed from any Mac or mobile device running Banktivity. You will give each cloud document a unique name so that you can choose which of your devices will sync with which documents. The cloud server is the documents’ home, so any changes you make to documents in the cloud will sync to all of your Banktivity devices. Banktivity Cloud Sync requires you to have a free Banktivity ID. To log in or sign up, make sure you are connected to the internet and choose File > Manage Banktivity Services > Banktivity ID. If you already have a Banktivity ID, simply enter your username and password, then click “Sign In” to continue. If you have not yet signed up for a Banktivity ID, click “Create Banktivity ID,” fill out the form on the next page, and click “Create Banktivity ID” again to submit your registration details. Assuming you have chosen an ID that has not been used before and the rest of the form has been filled out properly, your ID will be created and Banktivity will log you in automatically. Later on, check your email for a message from IGG Software that will allow you to verify your email address. If you do not complete verification within 14 days, your Banktivity ID will be locked and Banktivity will display a prompt to resend the verification email. Once you are logged in, you can review your account details and make changes as needed (for example, to update your email address or change your password). The Banktivity document will remain logged in until you return to the Banktivity ID management screen and click the “Logout” button. 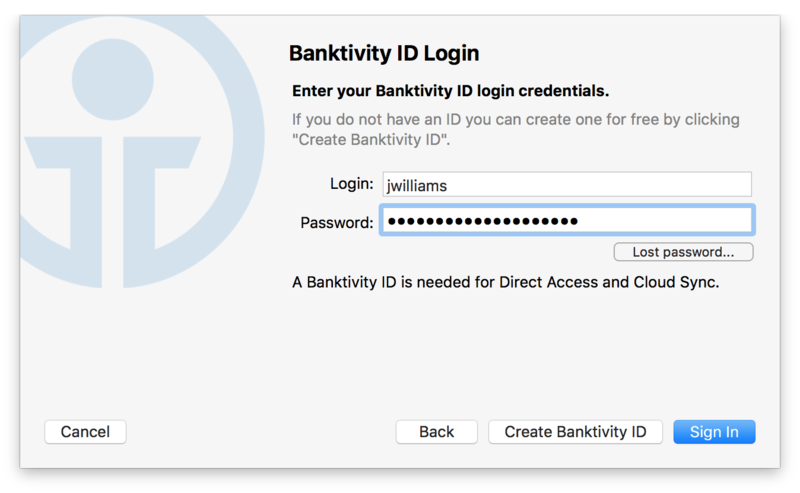 The username and password for your Banktivity ID are stored in the macOS Keychain. Click “Done” to return to Banktivity’s main window. Launch Banktivity on your Mac and open a document you want to use with Cloud Sync. Choose File > Manage Banktivity Services > Set Up Sync to begin the setup process. Enter a name for the cloud document. This name will be visible to your other devices when you configure them for Cloud Sync. Choose a password to encrypt the cloud document. You must not forget the password – it is required to set up other devices to sync with this cloud document. Choose File > New > Document from Cloud Sync. If a document is already open, tap “Back” to return to the Banktivity home screen. At this time, transaction attachments, category images, and security price histories do not sync between devices. You can initiate a sync at any time by clicking the “Update” button on the toolbar or choosing View > Bring Up to Date. Along with initiating a cloud sync, this will also update your accounts, security quotes, exchange rates, and bill pay payments. In addition, there is a setting to “Automatically update documents” in Banktivity > Preferences. When that option is checked, your documents will sync automatically when they are opened and closed. This entry was posted in Banktivity 7, Banktivity 6, Banktivity for iPhone, Banktivity for iPad.